As I sat down to write this, I read first the review by METraylor. I'm left with the feeling that everything I could say, they have said first and more eloquently. 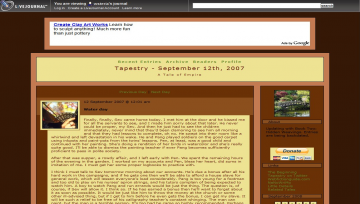 Tapestry is a lovely anomaly in the world of webfiction. At turns sweet, dark, and dramatic, the story draws you in and keeps you reading, long part, in this reader's case, your bedtime. Told in the form of a journal, it tells us of one woman's life, and through her, her family, and through her family, the country in which she lives. The feel of the setting is Asian, medieval in feel, in a war-torn nation; the narrator's husband is intimately involved in the war. In tone, it reminds me of the best of the gothic romances - the narrator and her husband are of a middling well-to-do family, as far as I can gauge; they have servants and tutors as well as slaves. The narrator runs her household, worries about her husband and children, and tells a delightful and engrossing story all at the same time. If I were more regular a reader, the irregular updating schedule might bother me. As it is, I come back and catch up every six months, and am un-bothered. Try Tapestry yourself. But be forewarned - you will find this hard to put down.